The Limestone Loop is a spectacular driving experience which takes travellers from Adelaide, all the way down to the southern township of Mount Gambier, and back up to Adelaide again. For the best experience, take 4 days to drive this loop and make sure to stop at the many natural attractions located along the way. It is best to break your trip down into manageable portions so that you can really enjoy the scenery as you go. 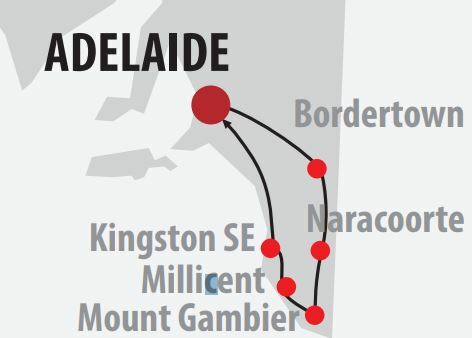 Start your trip and head south from Adelaide, towards the infamous town of Bordertown. Here you will be able to visit the Bob Hawke Museum and will also likely chance upon a huge mob of white kangaroos that call this town home. As you reach Padthaway, you will drive past vineyards and green farmland. Make sure to stop along the way at the famous Naracoorte Caves and Coonawarra. If you are a wine lover, make sure to leave some time to taste some of the best Cabernet Sauvignon and Shiraz in Australia. As you head further south, you will touch on the beautiful township of Penola where you can vistt the Mary MacKillop Interpretative Centre and learn about Australia’s first Saint. Once you reach Mount Gambier, make sure to visit the famous Blue Lake, Umpherston Sinkhole and Englebrecht Caves. Whilst in Mount Gambier, you may also wish to visit the coastal town of Port MacDonnell. The Tantanoola Caves are not far from here so make sure to add them to your itinerary. Millicent is only a short drive from Mount Gambier, so as you leave this town, start heading north-west and make a stop at Millicent where you can see the beautiful nature reserve known as Lake McIntyre. After leaving Millicent, head to the beautiful beachside townships of Beachport, Robe and Kingston SE. Make sure to try the crayfish along your route, as Robe produces some of he best crayfish in Australia. Complete your drive by returning to Adelaide or further north up to Coorong National Park. There are plenty of accommodation providers all along the route, so click the link below to find the best accommodation options along the Limestone Loop! Hi, I am planning a trip to Mount Gambier with my family for around 2 nights 3 days. I have a little one aged 5 months. Are the narcoote caves and Umpherston Sinkhole safe to take the little one? I understand that these places are not pram accessible and I am planning to put the baby in a baby carrier. Yes, both the Umpherston Sinkhole and the Naracoorte Caves are suitable for children.